Contemporary sociology does not have a single overarching foundation—it has varying methods, both qualitative and quantitative. The traditional focuses of sociology have included social stratification, social class, culture, social mobility, religion, secularization, law, and deviance. Sociology has gradually expanded its focus to include more diverse subjects such as health, medical, penal institutions, the Internet, or the role of social activity in the development of scientific knowledge. The linguistic and cultural turns of the mid-twentieth century led to increasingly interpretative, hermeneutic, and philosophic approaches to the analysis of society. hermeneutic: Something that explains, interprets, illustrates or elucidates. paradigm: A system of assumptions, concepts, values, and practices that constitutes a way of viewing reality. Although sociology emerged from Comte’s vision of a discipline that would subsume all other areas of scientific inquiry, that was the future of sociology. Far from replacing the other sciences, contemporary sociology has taken its place as a particular perspective for investigating human social life. The traditional focuses of sociology have included social stratification, social class, culture, social mobility, religion, secularization, law, and deviance. As all spheres of human activity are affected by the interplay between social structure and individual agency, sociology has gradually expanded to focus on more diverse subjects such as health, medical, military and penal institutions, the Internet, and the role of social activity in the development of scientific knowledge. The range of social scientific methodology has also expanded. Social researchers draw upon a variety of qualitative and quantitative techniques. The linguistic and cultural turns of the mid-twentieth century led to increasingly interpretative, hermeneutic, and philosophic approaches to the analysis of society. Conversely, recent decades have seen the rise of new analytically, mathematically, and computationally rigorous techniques such as agent-based modelling and social network analysis. Presently, sociological theories lack a single overarching foundation, and there is little consensus about what such a framework should consist of. However, a number of broad paradigms cover much modern sociological theorizing. In the humanistic parts of the discipline, these paradigms are referred to as social theory, often shared with the humanities. The discipline’s dominant scientifically-oriented areas generally focus on a different set of theoretical perspectives, generally referred to as sociological theory. These include new institutionalism, social networks, social identity, social and cultural capital, toolkit and cognitive theories of culture, and resource mobilization. Analytical sociology is an ongoing effort to systematize many of these middle-range theories. 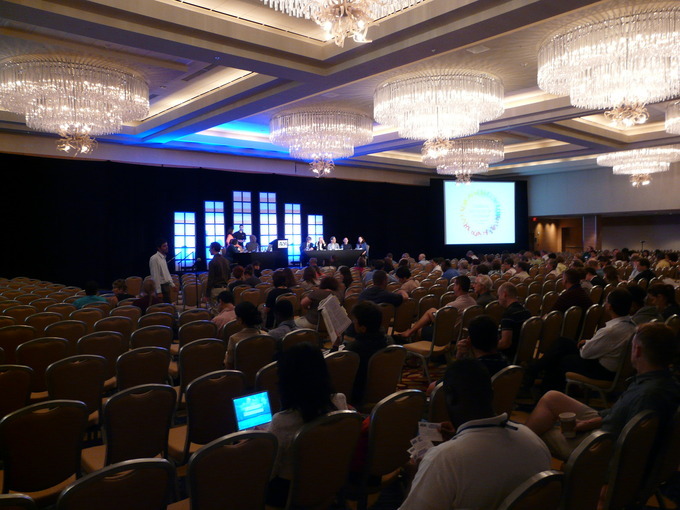 American Sociological Association: The American Sociological Association annual meetings are a way for contemporary sociologists to share their work and discuss the future of the discipline. Sociological study may be conducted at both macro (large-scale social processes) and micro (small group, face-to-face interactions) levels. Macro-level sociology looks at large-scale social processes, such as social stability and change. Micro-level sociology looks at small-scale interactions between individuals, such as conversation or group dynamics. Micro- and macro-level studies each have their own benefits and drawbacks. Macrosociology allows observation of large-scale patterns and trends, but runs the risk of seeing these trends as abstract entities that exist outside of the individuals who enact them on the ground. Microsociology allows for this on-the-ground analysis, but can fail to consider the larger forces that influence individual behavior. microsociology: Microsociology involves the study of people in face-to-face interactions. macrosociology: Macrosociology involves the study of widespread social processes. Sociological approaches are differentiated by the level of analysis. Macrosociology involves the study of widespread social processes. Microsociology involves the study of people at a more interpersonal level, as in face-to-face interactions. 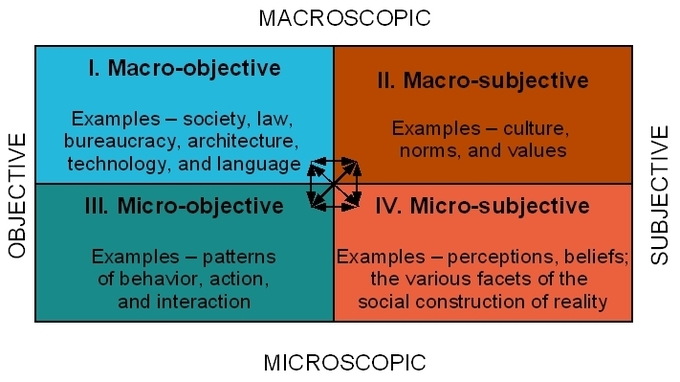 Macro and Micro Perspectives in Sociology: Just as scientists may study the natural world using different levels of analysis (e.g., physical, chemical, or biological), sociologists study the social world using different levels of analysis. The macro-level study of widespread social processes has been the more dominant approach, and has been practiced since sociology’s origins in the founding work of figures like Emile Durkheim. Durkheim, for example, studied the large-scale shift from homogenous traditional societies to industrialized societies, where each individual played a highly specialized role. The tendency toward macrosociology is evident in the kinds of questions that early sociologists asked: What holds societies together? How are norms (and deviance) established and handled by societies? What factors lead to social change, and what are the results of this change? Macrosociologists focus on society as a whole, as something that is prior to, and greater than, the sum of individual people. Studying social life on the micro-level is a more recent development (in the early and mid-twentieth century) in the history of the field, and was pioneered by proponents of the symbolic interactionism perspective, namely George Herbert Mead, Herbert Blumer, and Erving Goffmann. Mead was a pragmatist and behaviorist, which means several things. People define the social and physical “objects” they encounter in the world according to their use for them. If we want to understand actors, we must base that understanding on what people actually do. Blumer built on Mead’s work. He believed that individuals create their own social reality through collective and individual action, and that the creation of social reality is a continuous process. Goffman elaborated on both Mead and Blumer by formulating the dramaturgical approach. He saw a connection between the acts people put on in their daily life and theatrical performances. In social interaction, like in theatrical performance, there is a front region where the “actors” (individuals) are on stage in front of the audience. This is where the positive aspect of the idea of self and desired impressions is highlighted. There is a back region, or stage, that can also be considered a hidden or private place where individuals can be themselves and step out of their role or identity in society. Face-to-face interactions are, thus, a stage where people perform roles and practice impression management (i.e. “saving face”). Other scholars have since developed new research questions and methods for studying micro-level social processes. Micro- and macro-level studies each have their own benefits and drawbacks. Macrosociology allows observation of large-scale patterns and trends, but runs the risk of seeing these trends as abstract entities that exist outside of the individuals who enact them on the ground. Microsociology allows for this on-the-ground analysis, but can fail to consider the larger forces that influence individual behavior. A Taxonomy of Sociological Analysis: Sociological analysis can take place at the macro or micro level, and can be subjective or objective. Applied or clinical sociology uses sociological insights or methods to guide practice, research, or social reform. Sociological research can be divided into pure research and applied research. Pure research has no motive other than to further sociological knowledge, while applied research has a direct practical end. Applied research may be put into the service of the corporate world, governmental and international agencies, NGOs, or clinical work. In all these instances, they apply sociological theories and methods to further the goals of the organization they are working under. One budding area in modern retail firms is site selection, or the determination of the best locations for new stores. Site selection requires understanding human ecology and consumer spending patterns, both of which are addressed using the sociological imagination. Clinical sociology involves the study of groups of people using learned information in case and care management towards holistic life enrichment or improvement of social and life conditions. Clinical sociologists usually focus on vulnerable population groups, such as children, youths or elderly. clinical sociology: Clinical sociology courses give students the skills to be able to work effectively with clients, teach basic counseling skills, give knowledge that is useful for careers, such as victims assisting and drug rehabilitation, and teach the student how to integrate sociological knowledge with other fields. They may go into such areas as marriage and family therapy, and clinical social work. Sociotherapist: A sociotherapist practices sociotherapy, which is a social science and form of social work and sociology that involves the study of groups of people, its constituent individuals and their behavior, using learned information in case and care management towards holistic life enrichment or improvement of social and life conditions. Site Selection: Site selection indicates the practice of new facility location, both for business and government. Site selection involves measuring the needs of a new project against the merits of potential locations. Researchers often differentiate between “pure” and “applied” research. Presumably, pure research has no direct ends than adding to the knowledge pool, whereas applied research is put toward some practical end, such as working for a marketing firm to understand the relationship between race and consumption patterns or working for a government agency to study the reasons why poverty continues to exist. Of course, the line between pure and applied research is often blurred. For example, “pure” researchers in a university might get government funding to do their research projects, which somewhat complicates their commitment to do pure research. Outside the academic world, sociologists apply their skills in a variety of settings. Here, we will discuss the possibilities of applied sociology and one subfield, clinical sociology. Sociologists can be found working in a wide range of fields, including organizational planning, development, and training; human resource management; industrial relations; marketing; public relations; organizational research; and international business.In all these instances, they apply sociological theories and methods toward understanding social relations and human behavior to further the goals of the organization they are working under, whether this is a business, a governmental agency, or a non-profit organization. Some sociologists find that adapting their sociological training and insights to the business world is relatively easy. Corporations want and need to understand their customers’ habits and preferences in order to anticipate changes in their markets. This drive to understand consumers is called consumer research and is a growing interest of corporations. Sociologists are particularly well suited to apply their quantitative and qualitative understanding of human behavior to this field. Another budding area in modern retail firms is site selection, or the determination of the best locations for new stores. Site selection requires understanding human ecology and consumer spending patterns, both of which are addressed using the sociological imagination. 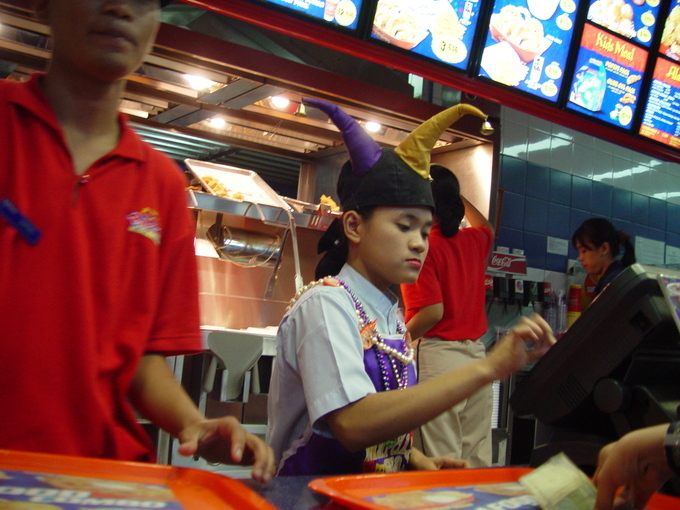 Some additional direct applications of sociology include concept and product testing (which will put to good use training in research methods), the evaluating of global market opportunities (which will draw upon understandings of various cultures), long-range planning and forecasting (which draws on both statistics and futurist perspectives), marketing and advertising (which applies consumer studies directly), and human resource management (which relies on studies of organizational behavior). Outside of the corporate world, sociology is often applied in governmental and international agencies such as the World Bank or United Nations. For example, a sociologist might work compiling and analyzing quantitative demographic data from the U.S. Census Bureau to understand patterns of population change. Or a sociologist might work for the United Nations to research global health trends and the efficacy of current public health initiatives. Jane Addams, Applied Sociologist: Jane Addams is considered by many to be one of the earliest sociologists, though her contributions were mostly to the application of sociology to social work. Non-Governmental Organizations (or NGOs) are legally constituted organizations created by private persons or organizations with no participation or representation of any government. Examples of NGOs include Oxfam, Catholic Relief Services, CARE International, and Lutheran World Relief. Many NGOs are concerned with the very social problems and social issues that sociologists study, from poverty to gender stratification to world population growth. Sociologists play important roles in the work of NGO’s from community organizing to direct relief to lobbying, as they are able to apply sociological approaches (for example, the conflict approach) to understand structural patterns that have led to current social problems. Clinical sociology involves the study of groups of people using learned information in case and care management towards holistic life enrichment or improvement of social and life conditions. A clinical sociologist, who might also be called a sociotherapist or life enrichment therapist, is usually concurrently a member of another relevant profession: medical doctor, psychiatrist, psychologist, nurse, social worker, criminologist, or activity and recreational professionals, among others. Clinical sociologists usually focus on vulnerable population groups, such as children, youths or elderly, and are employed in various settings such as treatment facilities or life care communities like nursing homes. They are directly involved in case management and care planning. Sociologists study many types of inequality, including economic inequality, racial/ethnic inequality, and gender inequality. People experience inequality throughout the life course, beginning in early childhood. Inequality early in life can affect life chances for the rest of one’s life. Inequality means people have unequal access to scarce and valued resources in society. These resources might be economic or political, such as health care, education, jobs, property and land ownership, housing, and ability to influence government policy. When we are growing up, we might hear our parents talk about others as being from the “wrong side of the tracks,” or not being “our kind. ” We also become aware of what kind of toys they have (or don’t have), the way others dress, what kind of house they live in, what jobs their parents have, and due to this, some are treated differently and have better opportunities than others. We see differences in elementary schools and high schools in our city. If our parents belong to the upper class, we have a good chance of graduating high school and entering higher education. The more education we have, the more active we will be in political life, the more traditional and conservative our religious affiliation, the more likely we will marry into a family with both economic and social capital, and the more likely we will eat better food, will be less exposed to unhygienic conditions, and be able to pay for good health care. Social stratification and inequality are everywhere and impact us throughout our lives. Just 400 Americans have the same wealth as half of all Americans combined. In 2007, more than 37 million U.S. citizens, or 12.5% of the population, were classified as poor by the Census Bureau. Although inequality is everywhere, there are many controversies and questions about inequality that sociologists are interested in, such as where did inequality come from? Why does it continue? Do we justify inequality? Can we eliminate inequality? Can we make a society in which people are equal? The sociological approach gives us the methodological and theoretical tools to begin to answer these questions. Cape Verde Water: The water situation in Cape Verde, an island country in the central Atlantic, is a poignant illustration of global social inequality. 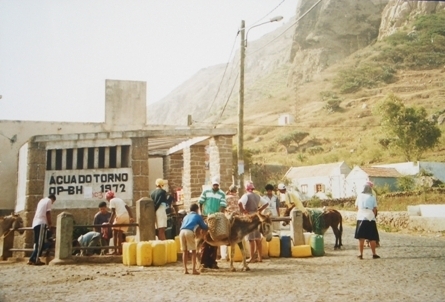 Most of the population in Cape Verde collects water at public water channels. 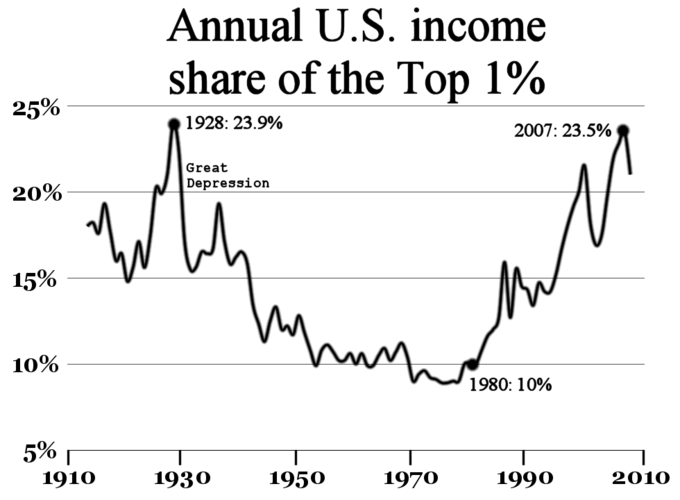 Income inequality: This chart shows the proportion of total income that goes to the richest 1% of Americans. After the Great Depression, this proportion fell as New Deal policies helped distribute income more evenly. But since the 1980s, the proportion rose rapidly, so that by 2007, the richest 1% of Americans earned almost a quarter of total income in the United States.